Well!! the great news is available on this page for those who are looking for Indian Army Jobs 2019. Everyone knows that the Joining Indian Army is one of the perfect career. 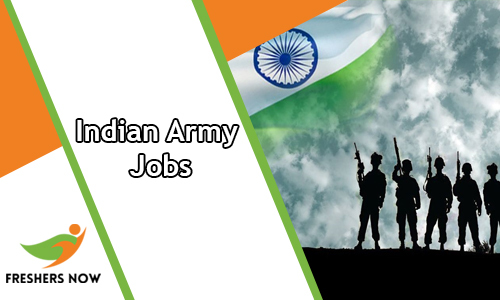 Job searchers who are showing their interest to Join Indian Army Jobs 2019 can utilize the latest Army Job Openings 2019 from this page. Job aspirants who want to serve their country can check and apply for the newly released recruitments through this article. We are sure many candidates would like to apply for the latest Indian Army Openings 2019. Job hunters are always interested to apply for the recently available recruitments. For those people, a vast number of Indian Army Openings 2019 are given in the below table. So interested one can pick up the recent openings and apply before the closing date. You can also visit the official website of Indian Army @ joinindianarmy.nic.in. Check out the Latest Indian Army Recruitment 20199 Notifications. These Notification cover Indian Army Vacancy 10th Pass, Indian Army Job after 10th, Latest Indian Army Rally 2019. By going to the www.indianarmy.nic.in, interested candidates can apply for the Vacancies, by checking all the details. Check the Indian Army Jobs 2019 for both freshers and experienced candidates. This is a unique page for the job hunters who want to Join Indian Army 2019. Aspirants if you are thinking to Join Indian Army, then you are in the exact place to check out all the newly released notifications from the authority. Many of the contenders have their own reasons to work with the Indian Army. All the young and dynamic youth are showing their interest in joining the Army Jobs 2019. Many of the candidates are thinking that how to join the army? if contender you are passionate regarding the Army Jobs 2019 then you have to check and apply for the latest Join Indian Army Jobs 2019 by following this page. Or you can also visit the official web portal @ joinindianarmy.nic.in and check the information. Aspirants who had completed their 10+2, Diploma, Engineering, Graduation, Post Graduation, ITI, PG Diploma in any recognized university or institute are eligible to apply for the latest Indian Army Jobs 2019. Many of the candidates want to fulfill their dreams in the best way possible. A huge number of aspirants want many satisfying professions such as Professional Advancement, Variety and Adventure, Quality of Life, Social Status, Economic Stability, Job Security and mainly Job Satisfaction. If you have been any possibilities to enter in the Join Indian Army 2019 then without delay refer all the details which we have given on this page. If you are eligible then also check the Govt Jobs form our website. Indian Army is the main land-based branch. Also, the Indian Army is the largest component of the Indian Armed Forces. The President of India is the Supreme Commander of the Indian Army and it is authorized by the Chief of Army Staff (CODS). It is founded on 1st April 1895 (122 Years ago). Its headquarters is located in New Delhi. The Vice Chief of the Army Staff (VCOAS) is Lieutenant General Sarath Chand, UYSM, AVSM, VSM. The Indian Army is a regimental system. It is operationally and geographically separated into seven commands. And the Indian Army involves more than 80% of the county’s active defense personnel. We are proud that it is the 2nd largest standing army in the world. Scroll down this page and get the most pretty information about Indian Army Jobs 2019. Every year the Indian Army reveals the many Join Indian Army Jobs 2019 on their official web portal that is joinindianarmy.nic.in. The notifications for both male and female (married and unmarried) will be released separately. So female candidates can also develop their bright future in the Indian Army Jobs 2019 by applying the Join Indian Army Openings 2019. Most of the candidates are failing to find the newly released Indian Army Jobs 2019. So our main advice for all those candidates is bookmark this page by pressing cntrl+d and get the latest updates. Also, get the upcoming Join Indian Army Job 2019 Notifications through this page. There are many openings in the Join Indian Army 2019 for the candidates such as Indian army vacancy 10th pass, Indian army vacancy for 12th pass, Indian army job after 10th, Indian army clerk recruitment etc. Many of the aspirants are seeking for the Join Indian Army Online Application Forms 2019. At the above table, we have given a list of openings. Click on an apply link and refer all the details. The details are education qualification, age limit, age relaxation, application fee, salary details, selection process etc refer all the details. If you are eligible then without waste a single minute of time and apply for the Indian Army Vacancies 2019. Hence, check the Indian Army Jobs 2019 page entirely. Interested one can also check the newly released Central Government Jobs 2019. The Indian Army is planning to release the Indian Army Chennai Rally 2019 Notification, Indian Army Religious Teacher Recruitment. So those who are eager to join with Join Indian Army 2019 can check the above given recruitments and apply on or before the deadline. The Indian Army didn’t accept the late application forms. Those who have satisfied with all the eligibility criteria details are only eligible to apply. After completion of the application process, you need to take a look at the Syllabus and Previous Year Question Papers and work hard. Before going to participate in the selection process, the preparation is very important. and check the exam pattern, syllabus and old papers. Soldiers, Group C Civilian, Safaiwala, Data Entry Operator, MTS, Material Assistant, Cook, Barber, Ward Sahayika, Messenger, Industrial Employees (Semi Skilled) and many other vacancies are available in the above table. Also, the selected candidates can get an expensive pay scale along with the grade pay. The Indian Army provides many benefits to their employees. Some of the benefits are bets salary, medical benefits, csd facilities, free ration, accommodation etc. We are very confident that the current article related to Indian Army Jobs 2019 helps many of the job seekers. If you have any query related to this article then drop the comment at below comment box. As soon as possible we will respond and clarify all the doubts. Visit www.freshersnow.com frequently and get the new updates.